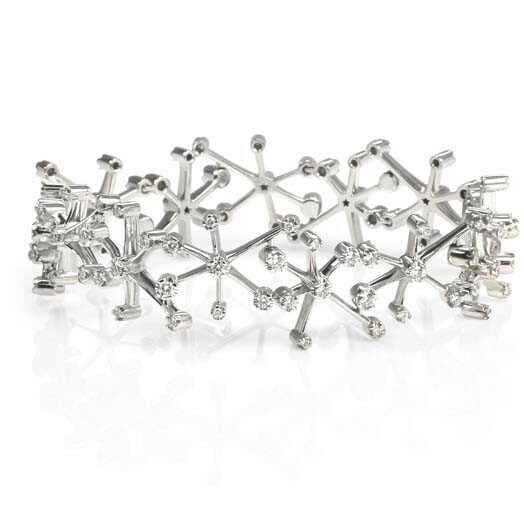 This 18K white gold custom diamond bracelet was designed as a tenth anniversary gift to complement a pair of earrings long-loved by the recipient. The bracelet incorporates an interesting personal element. There are 13 units with 7 stones each, totalling 91 diamonds in the bracelet. This number was chosen specifically at the time because it had meaning for the client. He and his wife were each 39 at the time, they had been married for 10 years, and had 3 children. Add up those numbers to get 91!